When Twin Peaks originally aired almost three decades ago, it was groundbreaking TV drama subverting the conventional narrative genre with strangeness and off-beat humour. Legend has it that Lynch even resisted revealing the identity of Laura Palmer’s killer. The trajectory of the typical narrative arc and resolution of key plot lines were of secondary consideration at best. Its appeal lay in the richness of its content: sexual exploitation, narcotics and the forces of international capitalism were all presented as gateways to other, deeper and more mysterious levels of reality beyond the human. Winningly, alongside the diminutive backwards-talking men, giants and uncertain owls, there were heartbreaking love affairs, practical wisdom, resilience and camaraderie. Every abstract interlude or odd occurrence encouraged the viewer to posit the strands of narrative that must surely connect these disparate pieces together. From the outset the viewer was immersed in this alluring world of Douglas Firs and risky rendezvous. Now, at the mid-season reverie, the subversion has become revolutionary. Any pretence at narrative is aborted from the moment bad Dale awakens black-eyed from his temporary murder. Instead we are presented with a concatenation of scenes, trippy, dream-like and epic in their scope. From the perspective of the viewer, much is reminiscent of lone pilot Dave’s journey in 2001, through the universe and across dimensions of time where any sense of scale is impossible to gauge. There is frustration for sure – now the spectacle is such that the viewer must interpret Lynch’s latest offering with almost total subjectivity. We’re not just playing detectives and following in Coop’s gumshoe footsteps anymore. Any semblance of narrative structure seems to be brought by the viewer. It’s as if there is no objective reality to grasp. In some quarters I suspect there is disappointment, even outrage. The coffee and donuts have been in short supply, the humour is far more bleak and the tone has shifted from virtuous to cynical. The folksiness of small town America has gone and very little familiarity is left. But if it’s character, pace, action and dialogue that you want, operating as an insightful, alternative take on life, then you can enjoy the ever burgeoning number of high quality dramas that have hit the small screen between Seasons 2 and 3 of Twin Peaks – Northern Exposure, Six Feet Under, Fargo… the list goes on. David Lynch is a maverick; he always brings something else to the table and he always confounds our expectations. Just like the first time round with Twin Peaks, Lynch has succeeded in innovating and expanding the limits of the medium. It’s just that it’s nothing like the first time. In Amsterdam, I recently visited the Dali and Banksy double-header at The Moco Museum. Like Dali, David Lynch’s work is suffused with the incongruous. Wandering around a labyrinthine network of small basement rooms amongst spindly-legged elephant sculptures, wilting clocks and predatory furniture is an intoxicating yet unsettling experience, perhaps akin to the state of mind of those condemned to wander the zig-zag floors of the Black Lodge. That staging of objects against a ‘floating world’, destroys context, liberates the unconscious mind and brings questions of meaning to the fore. It’s always been there in Twin Peaks. Yet during Part 8 of ‘The Return’, I started thinking of the pure surrealism of Bunuel and Dali’s L’Age D’Or. Make no mistake, this is surrealism on the same explosive, groundbreaking scale given the relatively mainstream audience, airtime and expectations. Only this is even more subtle, more dream-like and even more mysterious. Dali and Bunuel revealed their weapon, they revelled in presenting us with the blade, the symbol of how their movement, underpinned by the revelations of psychoanalysis, rent asunder our shallow understandings of our own conscious perceptions – Lynch, conversely, keeps his weapons concealed and we see only the effect. We witness the expression of an abstract yet increasingly visceral artistic vision. Yet still, we keep looking for the connections, the rationale, the structure. 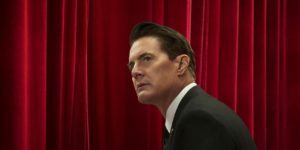 More than anything, great artists reveal great truths about ourselves – everything that is absent from Twin Peaks: The Return so far, reveals our predilection for just those things. I wonder will Twin Peaks: The Return offer resolutions of any kind? I’m becoming increasingly doubtful. It’s hard to imagine any conventional kind of resolution now anyhow, not if Lynch’s artistic evolution in Lost Highway, Mulholland Drive and Inland Empire are anything to go by. Narratives converge and diverge; identities are inherently dynamic and unstable. Whilst being ahead of the game in terms of what one can expect from long-running TV drama, Lynch’s recent work might be regarded as highly typical of the world we are now experiencing in the early 21st century: from quantum theory to politics, the micro to the macro, the personal to the national and beyond… narratives converge, diverge and become seemingly incoherent whereas the identity of individuals and truth become fluid. To watch Twin Peaks is to step through the interiors and exteriors of Edward Hopper brought into vivid yet tawdry animation. When swinging traffic lights and blank faced plug sockets teeter on the possibility of possessing inherent evil, it asks us to admit the strange otherness of objects and ultimately ourselves just as Dali did. But perhaps more than all these things I see the cold wind of alienation and anonymity typified by the writings of Kafka, also present in the current Twin Peaks. People devoured by systems and institutions, some of them real like the FBI, the police force, the Renault family, mortgages, insurance companies. Some of them more abstract – such as that thing in the woods. The characters themselves are atomised, insular, defeated: is anything more redolent of now? At the height of their powers, great artists such as Picasso, Dylan and Bowie anticipated as well as typified the world in their own lifetimes. In Season Three of Twin Peaks, Lynch has encapsulated the now and earned himself a place at that table. It is happening again. We are going back, but David Lynch knows we are lost and the small town of Twin Peaks no longer exists.